We wore our Grundens for the first time today, which made crossing our ravine no problem! Found a few redback salamanders. Everyone held them very carefully. The salamanders liked to crawl up our sleeves! Miss Anita made a fire for us. It was pretty cold once it started raining! Outdoor Math: Celia is showing her row of six leaves. This post is a special shout out to Trust for Our Future, MSAD 75s education trust, that allowed us to purchase Grundens raincoats, long underwear, and a tarp to stay warm and dry out in the woods. This gear made our Forest Days possible! It only rained one day this spring, and of course taking pictures while teaching is even harder in the rain, so these are all I’ve got. Warm and dry kids in the rain = happy kids in the rain (plus salamanders and worms don’t hurt either). This was one of our happiest Forest Mondays! Isla holding a salamander with such care. Dakota found something: I can’t tell if it is a worm or a slug. This was our first day finding redback salamanders, and in fact my first time finding them in these woods. I looked hard last year, but didn’t find any. Rain must have brought them out! They like to crawl up, and it take a steady hand to keep them from wiggling off. Isaiah and his stick. Note the fleece hat underneath, in June. It was cold! This game was moving too fast for me to get many pictures. This week was our last Forest Monday. 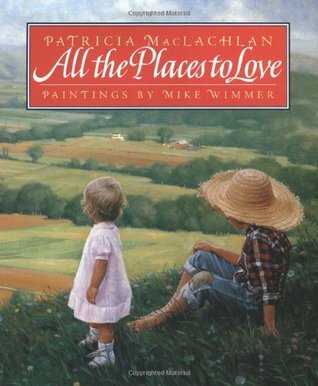 We read the book All the Places to Love by Patricia MacLachlan and talked about places we love– at home, school, and in our woods. We wrote our last Forest Journal about the place we love best in the woods. Ainsley took a big spill and Paisley helped cheer her up. Dakota and Ian discovered how to pull up the whole plant, roots and all. “Look, this plant has five leaves!” We also noticed they were shaped like hearts. Willow and Dakota found a nightcrawler! Willow in her Sit Spot. Avery at her tree in her Sit Spot. She was copying the songs of birds. Henry in his Sit Spot. Isaiah. I think his stick was a rocket launcher. Paisley in her Sit Spot. We found tons of Indian Paintbrush. Dakota was pointing out blackberry plants everywhere! Remember, families, please take your kids out to the woods this summer. They would love to share their favorite places with you. Thanks for a fabulous year! A beautiful, sunny, 65 degree day! We didn’t even bother with Grundens today, because we had a short Forest Day. That meant climbing was especially appealing. And we heard our regular chestnut-sided warblers during Sit Spots. Please-please-please-please-ta-MEETCHA! They are very loud! On Ian’s leaf there were hard little bumps. They might be eggs. This is Avery’s tree. She didn’t know what it was, so we looked it up in our tree book. It is an ash tree! We found these orange-petaled flowers. They looked like little sunflowers. This is Ainsley and she is the helper so she is carrying the bucket. She also is putting a buttercup near her chin to see if she likes butter. Isla was making a fairy house in her Sit Spot. Henry found this giant leaf in his Sit Spot! This is a tent caterpillar. You can tell by the white stripe. Dakota found tiny fiddleheads in his Sit Spot! We found leaves on a tree that we thought was dead. It was our bouncy tree. The leaves were growing out of the trunk. Charlotte saw a chipmunk and then “Whoosh!” it went into this hole where she is pointing. Willow was carrying a big stick back for firewood. It was too heavy so she had to ask Dakota for help. Thank you Grundens and Trust for Our Future for our new raincoats that we finally put to use. And thank you Mr. Frank for our excellent fire on a cold June day. First salamanders of the woods! We learned to hold them gently. Everyone had to try holding them. Once, or twice, or three times. I believe it was an eyepatch made of a fern. Who knew that rain makes leaves stick to your face? Lots of laughter today. Isla. The “Sonic” bunny is pretend. Olivia started to write: “I played with…” but her labels help us figure it out. Avery: “I got water with Dakota from the tarp.” Her picture clearly shows how the water ran off the tarp! Henry: “I found a cricket. I held it. It did not move.” His picture shows his hand hold the stick and the cricket. Henry carried it all the way up the hill like this to show to Mr. Frank! Gregory. The wood we found upstream looked like it was from an old snowmobile bridge. We stayed away from the rusty nails! Ainsley: “Me and Isla were holding a salamander. And I liked holding the salamander.” That is not an easy word to stretch out! Isaiah: “I played Sonic with Paisley.” Way to get down the beginning sounds you hear Isaiah!